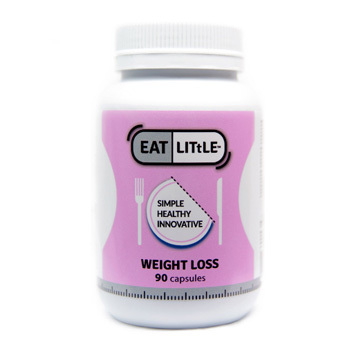 EatLittle™ is an innovative dietary supplement product for weight loss, based on a new and revolutionary technology. EatLittle™ is a swallowable pill that swells in the stomach upon contact with its gastric fluids and water taken with the capsule. EatLittle™ ingredients, soluble fibers and inert excipient, swell in the stomach and form a “chunk of food” with a volume of 20-25cc which precludes its expulsion through the pylorus. Once swollen, EatLittle™ sinks to the bottom of the stomach where most of gastric mechano-receptors are located. The contact between the receptors and EatLittle™ induces the receptors to send a signal to the brain indicating a sense of fullness and satiety. Gradually, in the framework of several, the swollen “chunks” lose their rigidness, disintegrate and transform into a biocompatible non-nutritional bolus which is expelled through the pylorus by natural peristalsis. Recommended dosage: One capsule, 15-30 minutes before each meal with a minimum of 300-500 ml (two large glasses) of room-temperature water per dosage. This represents a total of approximately 90 pills to be ingested per month. We ship internationally across all continents. FREE worldwide shipping for 2 or more bottles! Great product, you do not even have to take it every month, taking it one month on, one month off works great also! Highly recommended!